More than 70 years ago an unlikely hero saved the lives of dozens of American soldiers during one of the bloodiest battles of World War II. Now his story is about to explode onto movie screens all over the world. The international press is already hailing Hacksaw Ridge as a potential Oscar winner. It tells the story of Corporal Desmond Doss, a Seventh-day Adventist combat medic who single-handedly rescued 75 soldiers during the battle of Okinawa, in the midst of a hail of enemy gunfire. As a result of his bravery, Desmond Doss was awarded the Congressional Medal of Honor, the United States’ highest military honor. While Doss’ story has been told many times, Hacksaw Ridge is the first feature film to recount his remarkable exploits. The movie is directed by Hollywood heavyweight Mel Gibson who, having fallen foul of Hollywood and the media on numerous occasions, “may finally have found redemption” according to critics. David Rooney of the Hollywood Reporter has called the film a “forceful comeback,” while London’s Telegraph newspaper gave the movie a four-star rating. Hacksaw Ridge received a 10 minute standing ovation following its premiere at the Venice Film Festival. What this means is simply this: it looks like Hacksaw Ridge is going to be huge. And that matters for Christians, because it now seems likely that millions of people are going to watch the powerfully-told story of a war hero who was a deeply committed believer. And they’ll learn about—and talk about—not only his deeply-held biblical beliefs but also the remarkable God who enabled Doss to carry himself with such outstanding grace, commitment, and bravery. Hacksaw Ridge neither downplays Desmond Doss’ Seventh-day Adventist faith nor minimizes his beliefs. Instead, the movie respectfully and accurately portrays Doss’ steadfast faith in God. Corporal Doss—a Private First Class at the time of the Battle of Okinawa—is presented as a balanced, Sabbath-keeping, Bible-believing Christian who was moved by faith in God to adhere to his biblical beliefs in the face of overwhelming opposition. Mel Gibson’s Hacksaw Ridge is an inspirational story of a Christian’s unwavering faith. You don’t have to approve of movies, Hollywood, or Mel Gibson’s liberal use of battlefield violence, to be enthusiastic about the retelling of the Desmond Doss story. Hacksaw Ridge presents believers in Christ with an unprecedented opportunity to speak up for Christ as the story of an Adventist Christian thrusts the faith community into the national—and international—conversation. Hollywood is presenting Christians everywhere with a multimillion dollar opportunity to come along behind this headline-grabbing movie and speak in favor of the God—and the faith—of Desmond Doss. Churches and church members will need to be ready to engage in conversations with those who watch Hacksaw Ridge, and be prepared to answer questions about what drove Desmond Doss to be steadfast in his faith in God. For a window of time, Desmond Doss will be part of the global conversation. Believers should be ready to participate in the conversation and provide answers to the inevitable questions. 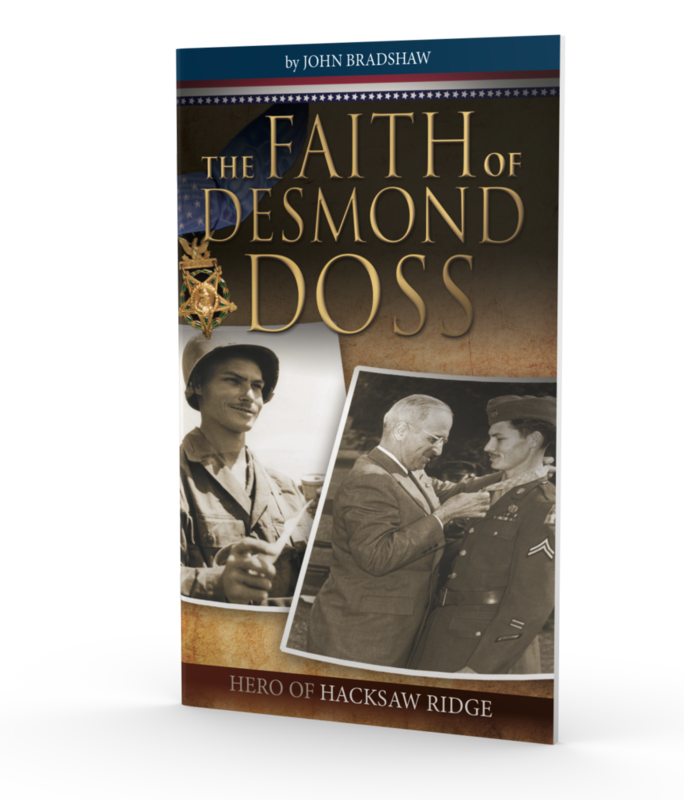 To assist with the witnessing opportunities presented by Hacksaw Ridge, It Is Written has produced a low-cost, 32 page booklet entitled “The Faith of Desmond Doss,” which can be ordered from It Is Written for witnessing and mass distribution. See below for details. Desmond Doss’ prayer is the prayer that should be prayed by Christians everywhere. “Lord, give me one more. Help me get one more!” As the last few sands pass through the hourglass of time, precious opportunities are being presented to reach this world for Christ. While Hacksaw Ridge is not intended to be an evangelism tool, disciples of Christ recognize that witnessing opportunities present themselves in countless ways. Even through Hollywood blockbusters. It’s hard to imagine God has not allowed the production of Hacksaw Ridge specifically for such a time as this, not to glorify Hollywood or Desmond Doss, but to call attention to theme of faith and grace. Desmond Doss now rests beneath a simple grave marker in the Chattanooga National Cemetery in Chattanooga, Tennessee. Ten years after his death Hollywood is telling the story of his battlefield heroism. It’s up to those of us still living to tell the story of his Savior, the power of grace and the promise of Jesus’ return. For more Hacksaw Ridge resources click here.